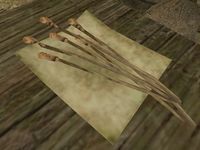 "Wickwheat is a wild Ashland grain with modest magical properties that grows in the Grazelands." 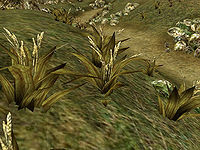 While wickwheat is found almost exclusively in the Grazelands, it grows there so profusely that it is in fact the most abundant plant in all of Vvardenfell. The fourth effect, damage intelligence, is found only on wickwheat, and thus will never appear in a potion nor be experienced if you eat it raw, since it is not the first effect. * These are not actually accessible, since you only see the ship at the beginning of the game before you are allowed to pick things up.